"It's all background noise," say the organizers of Asia CEO Awards. People throughout the world see Philippines as a "beacon of regularity and progress." Infrastructure investments soar. Poverty rates plummet. "Philippine economy in golden qage," says ADB. IMF "forecasts PHL 2nd fastest growing economy in the world." This is the story that Asia CEO Awards 2018 features the organizations and individuals making it all happen. The Board of Judges and Official Knowledge Partner, PwC, received the highest number of submissions in the 9-year history of the event. The Circle of Excellence awardees for each category will be announced at a special Press Conference on Friday, September 14, 2018 at the Manila Marriott, the Official Venue of the grand event. The board of judges include: Cesar Purisima, former Secretary of Finance; Charito Plaza, Director General of PEZA; Don Felbaum, former President of the American Chamber of Commerce, prominent economist Dr. Bernie Villegas; Jose Cuisia, former ambassador of the Philippines to the USA; principal architect Jun Palafox; Marife Zamora, former CEO of IBPAP; Ricahrd Mills, chairman of Asia CEO Awards. The grand winners of each company will be announced at the grand gala on October 16, 2018 at the Manila Marriott. The event will host the nation's most senior business and public sector leaders for a night of celebration, introductions and special performances by the Philippine Opera Company's Opus One, Opera Belles, and Harana. 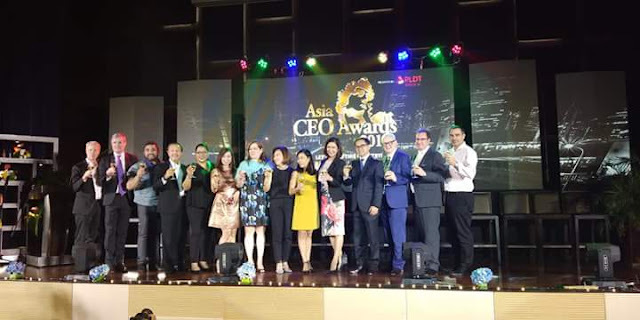 Considered a must-attend occasion for business and political leaders across the region, Asia CEO Awards encourages business development and investment. Asia CEO Awards 2018 Awards 2018 features sponsors that are the most important organizations in the nation. Title Sponsor: PLDT Enterprise. Elite Sponsors: CNN Philippines, Healthway Medical, ICM, I-Remit, JLL, Kalibrr, LBC Business Solutions, Philam Group, Regus, Sitel, Smart Enterprise, SPi Global, United Neon, WEnergy Global.